A man’s best friend is a title which is usually associated with dogs, and for reasons which have been proved to be rather true. Be it as a domestic pet or one offering services beyond the conventional needs, Dogs have been proved to provide comfort and assistance to humans on several occasions. To familiarize our readers, a Service Dog is a dog which has been trained to provide assistance to individuals who face disabilities such as; mental illnesses, visual and hearing impairment, PTSDs, Diabetes, trouble with mobility and several other health problems. Each service dog is trained for a specific assisting ability. They can be trained to switch on lights, push around a wheelchair manually, open doors etc. for someone who would have mobility issues. Seizure trained dogs are enabled to smell changes in their owner’s blood, identifying any warning signs which could indicate an oncoming seizure. This way, they can notify their owner and help take the precautions necessary. According to the ADA (The Americans with Disabilities Act), service dogs have not been categorized as pets, since they have been specifically trained to perform tasks for an individual with disabilities. They are quite often also said to be an extension of their owner, whom they provide their service for. The training for a service dog is usually quite expensive and time-consuming as well. The training for these dogs starts when they are merely two days old. Neuromuscular stimulation exercises are said to prepare the animals for identifying and handling potentially stressful situations. Their training period can last from months to even years sometimes. 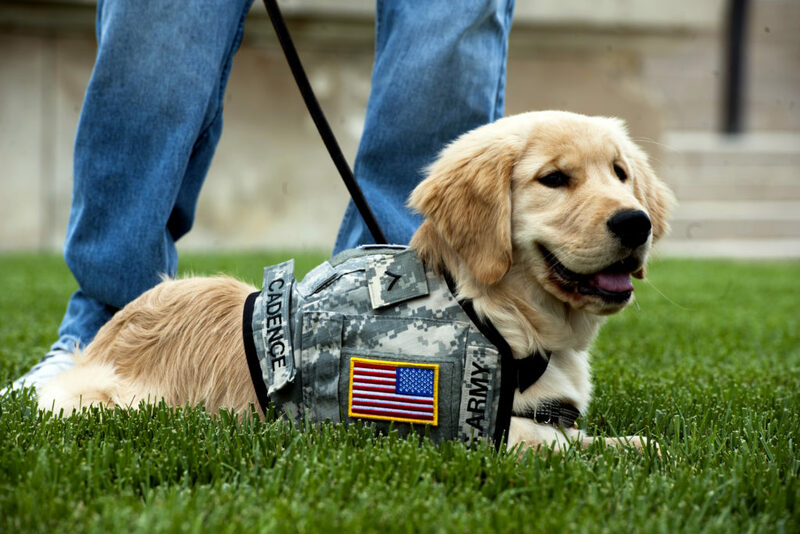 According to the ADA any breed of dogs can be trained for the service, however, retrievers are said to be the perfect candidates. This is because retrievers love to use their mouths and they have a good public reputation for themselves. As per law, service dogs aren’t required to wear the vests which identify them as working dogs, however, they are required to be on a leash whenever out in public places. They are also allowed to accompany their owners in places like Airports or Restaurants. The services provided by such trained dogs aren’t limited to individuals with a disability. Service dogs are also found in lending their assistance to government bodies such as the Police Department, Fire Department, Search and Rescue as well as Customs and Border Protection. Before getting a service dog, there are several factors which are taken into account. First and most importantly, does your medical service recommend you to get a service of this sort? Also, what kind of a lifestyle do you lead? Or are you financially sound to take care of the needs of your service dog. These are just a few of the factors which are considered before you are allotted a dog. For thousands of people who are facing disabilities, service dogs have become a vital part of their lives. Almost like a lifeline. People are able to gain their independence, giving them a strong sense of freedom and self-sufficiency. Be it a house pet, or one providing special services, dogs are renowned for helping you live your life with more ease and comfort. A true friend in the disguise of a four-legged animal.